XR-5 liner for oil and fuel containment. 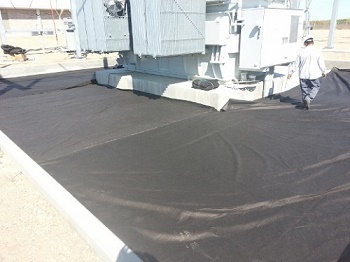 XR-5 geomembrane is one of the most well regarded oil containment liner materials in the world. It has been used by all of the major U.S. armed forces and top fortune 500 oil companies for various applications where many of the most challenging containment applications have been implemented, whether in primary containment or secondary containment. XR5 offers a 10 year limited warranty against several chemically caustic liquids including many hydrocarbons which are often considered the most difficult chemicals to contain. XR-5 uses a special proprietary blend of U.V. inhibitors along with hydrocarbon resistant Elvaloy to allow for long term immersion in many hazardous chemicals that would destroy most conventional geomembrane liners. Elvaloy was created by Dupont to allow normally homogeneous properties such as oil based pvc’s to be submerged in oil and not mix together over time. Oil & Jet Fuel, two of the most common containment uses for Xr5, destroys most liner materials within weeks if not days. Xr5 in many instances, can last several decades in the same applications. XR-5 liner material has some of the highest physical properties for a geomembrane liner as well, such as a highly resistant, non-degradable membrane surface. The high quality reinforcement thread gives the liner extreme puncture and tear resistance. The high quality coating allows for high dimensional stability under high loads and extreme temperature fluctuations. XR-5 is also easily heat welded, with very high peel strength. Western Environmental Liner can fabricate Xr5 into many different shapes and sizes to fit your particular need. Also turnkey installation is available if needed. Please contact a 30+ old containment liner manufacturer today to see if Xr5 is the right containment option for your particular liner application.